After several months of treatment for an all-to-common malady these days, and for which I received tremendous medical guidance and support from the Juravinksi Centre, a knock came to my door. It was esteemed radiologist and all-round great guy Stephen Sagar and his lovely partner Christina. The good doctor was key to zapping the unwelcome intruders out of my system and also keeping my spirits up. He was popping in to my studio to have a look at a particular painting that we had talked about — Night of the Living Deb. 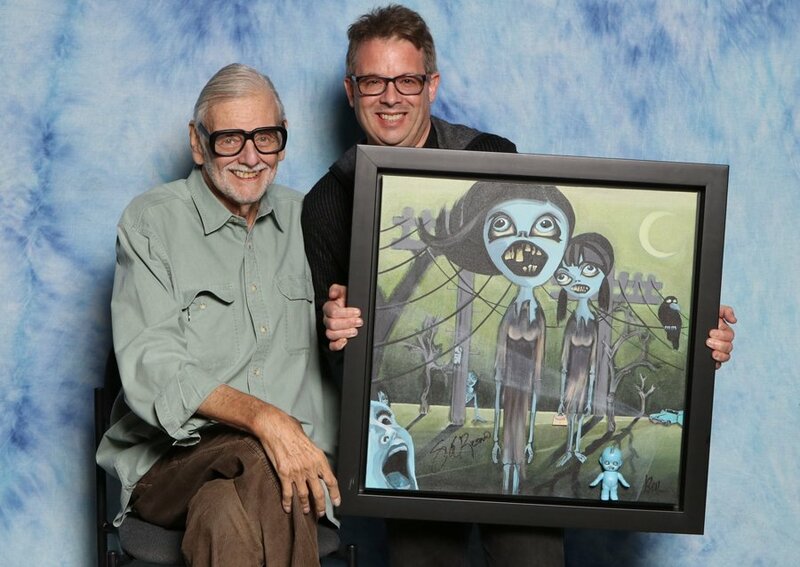 The painting was part of an effort several years back to commemorate the masterpiece film Night of the Living Dead by cult director George Romero. The image of my painting was as part of a collection of images for a book. I kept original of course, and never planned to part with it. It was meant to be part of Dr. Sagar’s own collection. Then, the painting had a new life. As a lifelong fan of Romero and his movies, Dr. Sagar made a point of meeting the director at a Canadian ComicCon event. He had the painting with him, all nicely framed and ready for the possibility that Romero might agree to sign. And he did — just months before he died. A photo is of two heroes of mine. I cherish the moment and will endure in a very meaningful way.